For the last four years, Yoga With Adriene has put out a month-long daily yoga challenge in January. Each day builds on the previous one, with cohesive themes throughout and a good alternation of stretching, strengthening, and calming days. During the rest of the year, YWA puts out a monthly calendar with previously-published videos slated for each day. There’s a general theme, and new vids every Sunday, but over the last few months, I’ve found less cohesion in these calendars. Often, I end up skipping the recommendations and finding a video that suits me for the day instead, or I just skip yoga altogether. So far this month, I’ve only done six yoga sessions. !!! I just don’t look forward to these calendars the way I do to the cohesive January challenges. Therefore, I’ve put together a personal yoga challenge. Starting today, I’ll begin the 2015 January yoga challenge from YWA (30 Days of Yoga). Once that’s done, I’ll move on to those from 2016, 2017, and 2018, before incorporating the 2019 January challenge, whatever it turns out to be. Then I’ll do the whole cycle again, trying to get three full cycles of all five challenges done by the end of 2019. There are enough differently-themed challenges to provide plenty of variety, and I’ll still take days off to do the new vids on Sundays, plus break days. But I feel I’ll be more focused and eager to do my yoga practice this way. Before each 30-day challenge, I’m taking photos of about twenty yoga poses, so that I can chart my personal progress over time. 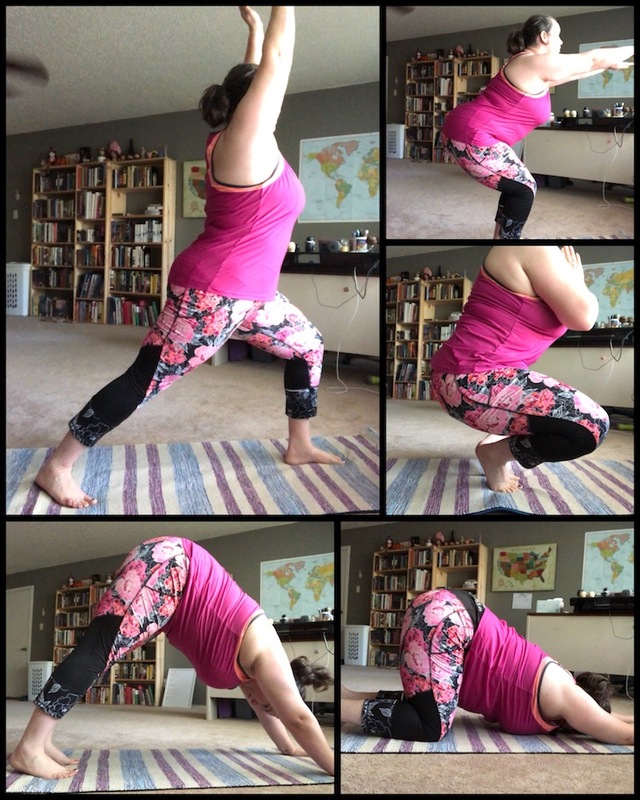 (Pictured: warrior I, chair, toe stand/squat, downward dog, and heart-to-earth) I took the first round of photos yesterday, and MAN I need some real work on some of these. Wish me luck! This entry was posted in Wellness and tagged fitness, goals. Bookmark the permalink. You look fine to me! Granted, I am by no means a yoga expert since I haven’t done any yoga in at least four or five years. But your heels are farther down in DD than mine ever were! DD isn’t as much of a problem for me (except in how HARD it still is to do!) – but poses like the warrior poses and chair and lunges and such – I’m not very flexible and not very strong, so those are not nearly as good as I’d like them to be one day!